The intimate diary of Frida Kahlo is really no such thing – rather it is a literary self-portrait comparable in quality to the pictures the artist painted of herself, an Italian researcher told EFE. The specialist in intimate literature Cristina Secci, a native of Cagliari, Italy, presented Saturday in Mexico City a study of the literary genre to which Kahlo’s diary belongs. The diary was written during the last 10 years of Frida’s life, but even so contains few dates, an unusual trait in writings like this. “An intimate diary is so personal that you hide it in the bottom drawer. But Frida didn’t. She read certain parts to her guests and friends, she allowed herself to be photographed with it and even gave away pages to her friends, so they say,” she said in an interview. Secci said that when the reader opens any “intimate diary,” he or she expects to find such elements as love affairs, dreams, sufferings and betrayals. Frida (1907-1954) included all that but also included her thoughts on politics, art, poetry and other subjects. “The elements of this work are different from those of an intimate diary,” the Italian said in stressing the originality of Frida’s writing. “Since Kahlo is a painter, it all gets away from her and painting overflows the diary – she also includes color” so that it becomes a fundamental part of it, with the words becoming pictures and the pictures words, she said. At times Kahlo would write a large part of the diary with a paintbrush, she said. Secci said that sometimes the handwriting of the text “overflows” and becomes landscape as well, so that the words lose their literal meanings and acquire new ones. She recalled that one characteristic of self-portraits is that they show the image the artist wants others to see, which is not necessarily the real one. “I don’t mean it’s a lie, but it is very subjective,” she said. Another clue proving that this is not a traditional diary are the words erased and crossed out in the text. “More than a diary, Frida wrote it as a self-portrait, to place beside the many she painted,” said the Italian philologist, adding that this does not mean the writings are any the less intimate. “Frida had a great ability to express her intimacy, whether in painting, letters or prose…that’s why I don’t believe she would need a genuine intimate diary,” she said. Approximately forty-six portraits of Frida Kahlo and three letters she wrote to Nikolas Muray comprise this exhibition. The photographs, dating from 1937 to 1941, were taken by Nickolas Muray, Kahlo’s friend, lover and confidant. Muray began photographing Kahlo in color in the winter of 1938-1939, while she was in New York attending an exhibition of her paintings at the Julien Levy Gallery. Muray photographed Frida more often than any other single person and his compelling photographs bring to light Kahlo’s deep interest in her Mexican heritage, her life and the people significant to her. On View through16 November, 2008. 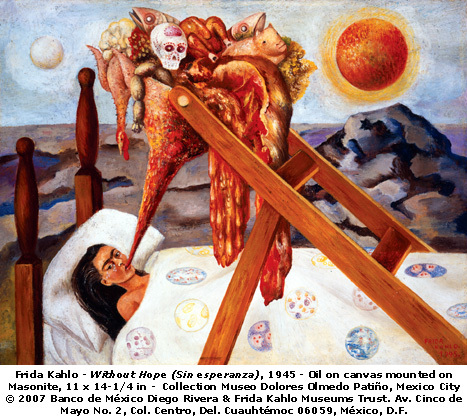 Through September 28, 2008, the San Francisco Museum of Modern Art (SFMOMA) presents the exhibition Frida Kahlo. Organized by world-renowned Frida Kahlo biographer and art historian Hayden Herrera, the presentation will include approximately 50 paintings from the beginning of Kahlo’s career in 1926 to her death in 1954. The San Francisco presentation is organized by John Zarobell, SFMOMA assistant curator of painting and sculpture. While concentrating on Kahlo’s hauntingly seductive and often brutal self-portraits, the exhibition also will include those particular portraits and still-life paintings that amplify her sense of identity. The peculiar tension between the intimacy of Kahlo’s subject matter and the reserve of her public persona gives her self-portraits the impact of icons. As her practice progressed, her images grew in confidence and complexity, reflecting her private obsessions and political concerns. Kahlo struggled to gain visibility and recognition both as a woman and an artist, and she was a central player in the political and artistic revolutions occurring throughout the world. The exhibition also will feature photographs that once belonged to Kahlo and Diego Rivera from the Vicente Wolf Photography Collection, many of which have never before been published or exhibited. Emblematic images of Kahlo and Rivera by preeminent photographers of the period (Manuel Alvarez Bravo, Lola Alvarez Bravo, Gisele Freund, Tina Modotti, Nickolas Muray) will be on view alongside never-before-seen personal snapshots of the artist with family and friends, including such cultural and political luminaries as André Breton and Leon Trotsky. These photographs—several of which Kahlo hand-inscribed with dedications; effaced with self-deprecating marks; and kissed, leaving a trace of lipstick—pose fascinating questions about an artist who was both the consummate manufacturer of her own image and a beguiling and willing photographic subject. During her lifetime, Kahlo was best known as the flamboyant wife of renowned muralist Rivera. Today she has become one of the most celebrated and revered artists in the world. Between 1926, when she began to paint while recuperating from a near-fatal bus accident, and 1954, when she died at age 47, Kahlo painted some 66 self-portraits and about 80 paintings of other subjects, mostly still lifes and portraits of friends. “I paint my own reality,” she said. “The only thing I know is that I paint because I need to.” Her reality and her need to explore and confirm it by depicting her own image have given us some of the most powerful and original images of the 20th century. Paradoxically, her work allowed her to both express and continually fabricate her own subjectivity. Kahlo was born in 1907 in Coyoacán, then a southern suburb of Mexico City. Three years after the 1925 bus accident, she showed her paintings to Rivera. He admired the paintings, and the painter, and a year later they married. Theirs was a tumultuous relationship: Rivera once declared himself to be “unfit for fidelity,” and Kahlo largely withstood his promiscuity. 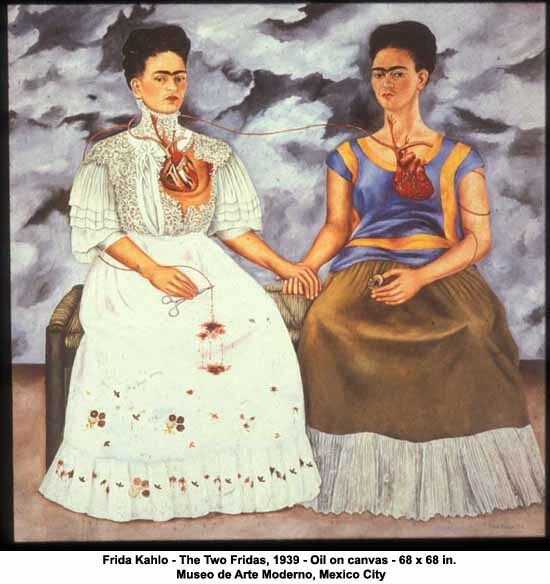 As if to assuage her pain, Kahlo recorded the vicissitudes of her marriage in paint. She also recorded the misery of her deteriorating health—the orthopedic corsets she was forced to wear, the numerous spinal surgeries, plus a number of miscarriages and therapeutic abortions. Her painful subject matter is distanced by an intentional primitivism, as well as by the canvases’ small scale. Kahlo’s sometimes grueling imagery is also mitigated by her sardonic humor and extraordinary imagination. Her sense of fantasy, fed by Mexican popular art and pre-Columbian culture, was noted by surrealist poet and essayist Breton when he came to Mexico in 1938 and claimed Kahlo for Surrealism. She rejected the designation but clearly understood that doors would open under the surrealist label—and they did: Breton helped secure exhibitions for her in New York in 1938 and Paris in 1939. Kahlo had her first exhibition in Mexico in 1953. Defying doctor’s orders, she attended the opening and received guests while reclining on her own four-poster bed. Because she could not sit up for long and she suffered severe effects from prescribed painkillers, her paintings in the period from 1952 to 1954 lost the jewel-like refinement of her earlier works. Her late still lifes and self-portraits—many of which proclaim Kahlo’s allegiance to Communist doctrine—testify to her passion for life and her indomitable will, however. Frida Kahlo brings together works such as Henry Ford Hospital (1932), depicting the artist’s miscarriage in Detroit (a first in terms of the iconography of Western art history), and The Broken Column (1944), painted after she underwent spinal surgery. It also includes self-portraits such as Me and My Doll (1937) and Self-Portrait with Monkeys (1943), both of which explore the theme of childlessness. The artist’s suffering over Rivera’s betrayals is reflected in paintings like her masterful double-portrait The Two Fridas (1939); created during her separation and divorce from Rivera, the work presents a powerful depiction of pain inflicted by love and Kahlo’s divided sense of self. Collectively, these images suggest the extent to which, for Kahlo, painting served as catharsis, as well as an opportunity to redefine and critique modern bourgeois society. Collectors of Kahlo’s work can be found around the world—the paintings in the exhibition come from some 30 private and institutional collections in France, Japan, Mexico, and the United States. Several paintings have never before been on public view in the United States. Two of the most important and extensive collections of Kahlo’s work—the Museo Dolores Olmedo Patiño Collection in Mexico City and the Jacques and Natasha Gelman Collection of Modern and Contemporary Mexican Art, currently housed in the Centro Cultural Muros in Cuernavaca—have loaned some of their most treasured Kahlo paintings to the exhibition. The exhibition is accompanied by a richly illustrated 304-page catalogue featuring more than 100 color plates, as well as critical essays by Herrera, exhibition co-curator Elizabeth Carpenter, and Latin American art curator and critic Victor Zamudio-Taylor. A separate plate section is devoted to works from the Vicente Wolf Photography Collection. The catalogue also includes an extensive illustrated timeline of relevant socio-political world events, artistic and cultural developments, and significant personal experiences that took place during Kahlo’s lifetime, along with a selected bibliography, exhibition history, and index. From June 14 to September 28, 2008, the San Francisco Museum of Modern Art (SFMOMA) will present the exhibition Frida Kahlo. Organized by world-renowned Frida Kahlo biographer and art historian Hayden Herrera, the presentation will include approximately 50 paintings from the beginning of Kahlo’s career in 1926 to her death in 1954. The San Francisco presentation is organized by John Zarobell, SFMOMA assistant curator of painting and sculpture. 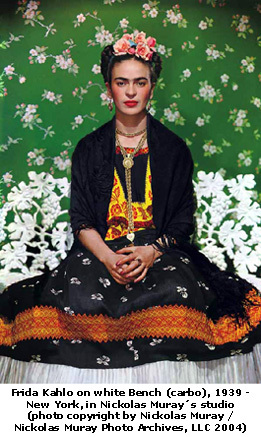 The Delaware Art Museum presents Frida Kahlo: Through the Lens of Nickolas Muray, an exhibition of nearly 50 photographs of Frida Kahlo, on view in the Brock J. Vinton Galleries February 2, 2008 – March 30, 2008. Known for the rich colors and deeply personal meanings of her paintings, Frida Kahlo was often her own subject as well as a subject for other artists. The photographs in this exhibition, taken by Nickolas Muray, date from 1937 to 1941. 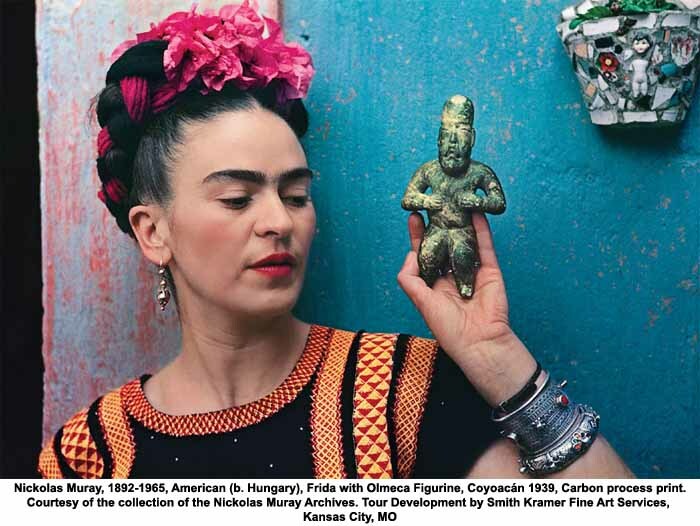 A touring exhibition devoted to the art of Frida Kahlo (1907-1954) will be on view at the Philadelphia Museum of Art from February 20 through May 18, 2008. Organized in celebration of the 100th anniversary of Kahlo’s birth, it will present approximately fifty paintings from the beginning of her career in 1926 to the year of her death in 1954. 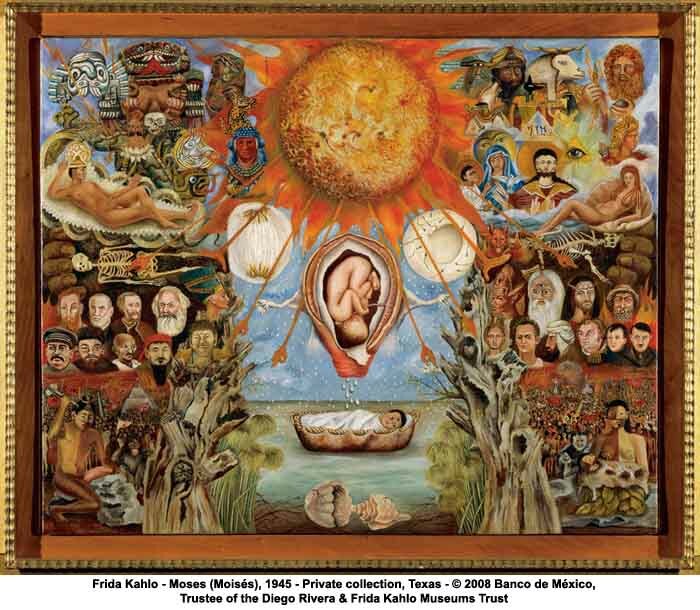 Frida Kahlo is the first major presentation of the Mexican artist’s works in the United States in nearly fifteen years.